Plastic helmets were prohibited because some claimed they were being used more as weapons than as protection. An artificial tee was permitted for kickoffs. 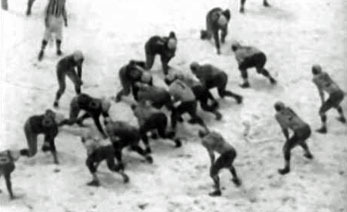 When the passer is sacked, the game clock is stopped until any receivers who had gone downfield have a reasonable time to return to the huddle. When the offense is charged with delay of game, the defense may decline the penalty. Two deaths, a coach and a player, rocked the NFL in 1948. 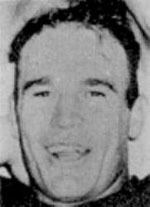 Pittsburgh coach Jock Sutherland, who had just led the Steelers to their best season ever - a tie for the Eastern crown before losing to the Eagles in the playoff - died suddenly in April of a brain tumor. The Steelers fell from 8-4 in '47 to 4-8 in '48. 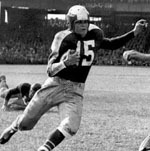 The defending league champion Chicago Cardinals were stunned when, after defeating the Eagles 21-14 in their opener, T Stan Mauldin collapsed and died of a heart attack in the locker room. The distracted Cards lost their next game to the Bears 28-17, then rattled off nine straight wins. That set up the annual season finale against the Monsters of the Midway in Wrigley Field as the de facto Western Conference playoff since both teams boasted 10-1 records. The heavily favored Bears, who allowed the fewest points in the league, led 21-10 entering Q4 only to have the Cardinals score two TDs to repeat as division champions. 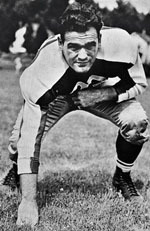 In the East, the Redskins started strong behind the passing of Sammy Baugh. They shrugged off a 45-0 pasting by the Eagles in Game 4 to compile a 6-2 record. 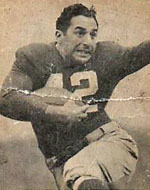 Then opponents took advantage of the Skins' porous pass D to score over 40 points in three straight games to knock Washington out of the Eastern race. That opened the way for the Eagles to defend their crown with a 9-2-1 record. (Redskin opponents passed so much that rookie DB Dan Sandifer set a league record with 13 INTs.) 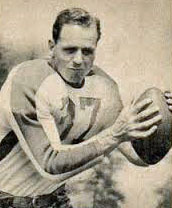 The Eagles' Steve Van Buren led the league in rushing for the second straight year with 945y. Greasy Neale's 5-2-4 defense finished second to the Bears in points allowed and led the league in offensive-defensive yardage differential, outgaining opponents by 1,482y. 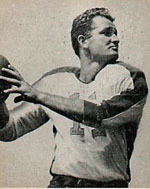 To counter the growing passing threat, Neale had his LBs slow opposing receivers coming off the line of scrimmage, a tactic that came to be known as the "Eagles Defense." Steve Van Buren was born in La Ceiba, Honduras, where his father was a fruit inspector. When Steve was 10, his parents died, and he and his three sisters came to New Orleans to live with their grandparents. Too small to make the Warren Easton High School team until his senior year, he became an outstanding end who caught the eye of LSU Coach Bernie Moore. After playing end as a sophomore and blocking back as a junior, Steve finally got a chance to carry the ball as a senior and made the most of the opportunity. 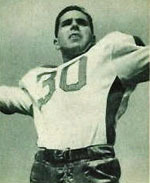 He gained 847y and scored 14 TDs in eight regular season games, then became the MVP of the 1944 Orange Bowl. 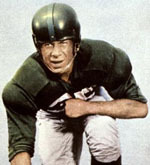 The Eagles selected Van Buren in the first round of the draft (#5 overall). He immediately helped reverse the dismal fortunes of the franchise. Steve made the highest salary on the team, $13,000, which was $1,000 more than Coach Neale. So the title game for the fourth time featured a rematch of the previous year's finale. As good as the teams were in '47, each had been improved. The Eagles added depth to their line while Chicago did the same for their backfield. 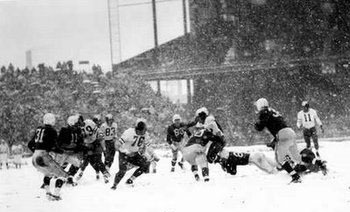 The Cardinals, winners of five straight over Philly if you count two exhibitoin games, were established as a 3 1/2 point favorite, although the forecast of either rain or snow for game day threw all bets off and opened the door to breaks deciding the winner. 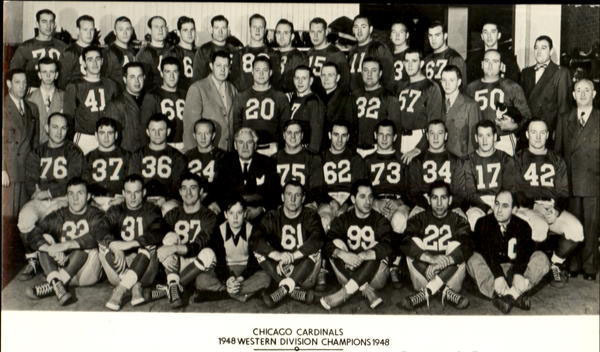 Chicago coach Jimmy Conzelman considered his team "false favorites." We are a tired club that has been going at top speed since July. The Eagles have been able to coast for the last couple of weeks, and they will have the advantage of playing on their home grounds, which should be worth one touchdown at least. Statistics lean to them, too, and I just can't see how we have been installed as favorites. Neale refused to get caught up in the discussion of which team should be favored. I believe we are as strong as the Cardinals along the ground and in the air. The weather might force the breaks. 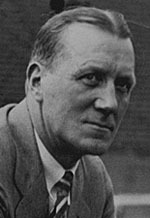 Arthur Daley of The New York Times described the two head coaches as a pair of amiable and delightful whacks. He added that they were two of the most colorful characters in sport, each blessed with a keen sense of humor even though Conzelman is funnier by far. Oddly enough, though, neither of them ever can see anything light or gay during a football game. They are studies in dark and moody concentration. Since he once was an actor, Jimmy gives with the facial contortions, emotionally expressive at all times. Greasy is a bundle of nerves, striding up and down the sidelines so impatiently that he never wears an overcoat, regardless of the weather. Each team worked out the day before the game. Greasy directed his Eagles through a spirited 90-minute drill that concentrated on pass offense and defense, kicking off, and protecting against EP kicks. 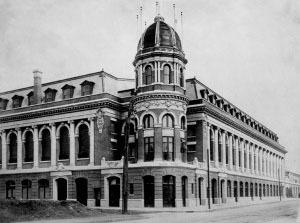 Shibe Park was sold out for the big game - 37,061 tickets with no standing room. The net gate was estimated to be in the neighborhood of $127,000. Add the $33,000 for radio, television, and movies to get a total of $160,000. The Cardinals worked out after their train arrived Saturday morning. Their session was deemed "less vigorous" by observers. Both teams were as near to full strength as could be expected after a grueling season. Ernie Steele and Russ Craft, a couple of Neale's DBs, nursed pulled leg tendons but were expected to play with extra taping. The Cardinals' QB Paul Christman had endured a hard luck season. First, he suffered a fractured left wrist in the first Bears game October 4. After being sidelined for six weeks, he returned the last Sunday of the regular season to face the crosstown rivals a second time. But this time Christman broke the index finger on his right or throwing hand. The cast would be removed Sunday morning, but it was unlikely Paul would be able to grip the ball. (He would not play at all.) 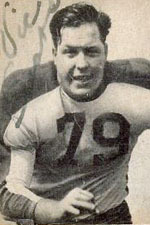 Conzelman was prepared to use Ray Mallouf, "the small man from SMU," who had led the Cards to victories in every game he started during Christman's absence. As you would expect, the offensive juggernauts boasted a number of men who made multiple All-Pro teams. 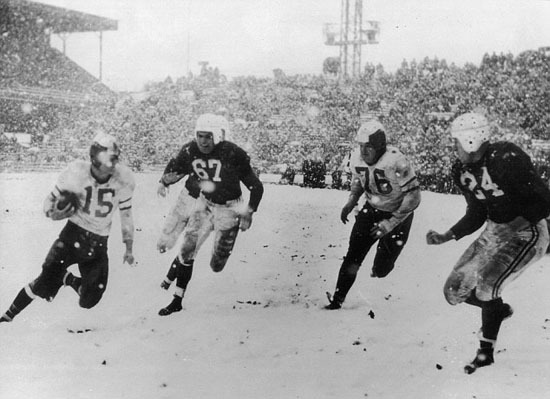 The 1948 game was the first NFL championship to be televised, although only in the northeast. Harry Wismer announced the ABC broadcast. In the early years of TV, viewers often saw "snow" (static) in the picture. When they tuned into this game, the snow they saw was real because a storm rolled through The City of Brotherly Love early on Sunday, December 19. Snow started falling at 7AM and continued all day. The wet accumulation disrupted ground transportation, stranding many ticket holders in their neighborhoods. But a surprising number of diehards walked long distances to reach Shibe Park. Outside the stadium, people sold tickets for as little as $1 or even gave them away. Fans accepted a new ticket if it put them under the overhang for better protection from the elements. Fortunately, only 7,000 seats were uncovered. Neale wanted to postpone the game, recalling the icy footing in the Windy City the previous year. He left his team in the locker room to confer with Cardinals' coach Conzelman and commissioner Bert Bell. Contemplating the sellout crowd and the ABC broadcast, Bell ordered the game played. Bert told the press that his hands were tied. We must consider the many out-of-towners who made long trips to see the game. There are 1,000 fans here from Chicago and many from Erie, Pittsburgh, New York, and other cities. We will have to play. One wag commented, They ought to play here today for the gate and at Miami Beach next Sunday for the championship. When Neale returned to the locker room, he told his team: Can you believe it? They want to play. Let's go beat the hell out of them. Eagles help remove the tarp. The conditions "beat the hell" out of both squads. Unlike Comiskey Park the year before, the Shibe Park field was covered. 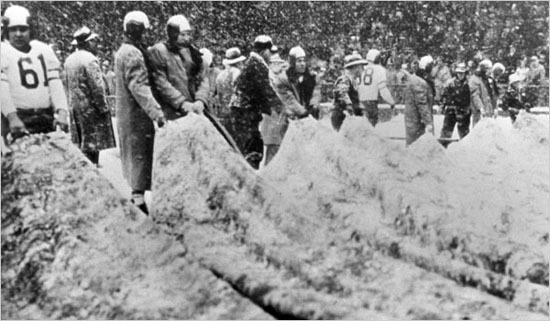 However, so much snow had fallen - an estimated 4" - that the grounds crew enlisted the two teams' muscle to drag the tarpaulin off. The kickoff was delayed thirty minutes. Officials had to guess at the yard lines as the snow fell throughout the game. Ropes marked the sidelines. Bell made the teams promise not to question Referee Ron Gibbs' judgments on matters of down and distance. Three alternate officials, in addition to the regular five, operated along the sidelines and in the end zone. Yo-Yo [G Mario Gianelli] and I went to breakfast at nine o'clock in the morning. It snowed a foot in the hour it took us to eat. We got out to Shibe Park, and you couldn't see a thing. But they were determined to play the game. A tarp was on the field and had to be taken off. The players helped the grounds crew do it. I think even some of the Cardinals helped us. We damned near had a disaster. One of the workers got caught in the thing, and we were just rolling him right up along with the tarp. The poor guy was wrapped up to his neck before we finally realized it. He coulda been suffocated! Even after we got the tarp off, the field was a mess. It continued to snow. You couldn't see a thing. I remember going downfield under a punt, and you couldn't see it. It just disappeared. Finally, when it came down, you still couldn't see the ball, just the shape of it under the snow. Eagles try to keep warm on their bench. After the decision to play was made, the Eagles still had a problem. With an hour to kickoff, Philly's star RB Steve Van Buren was nowhere to be found. Seeing the snow falling when he awoke that morning in his suburban home, he assumed the game would be postponed and went back to sleep. After another hour, he decided he had better get to Shibe Park just in case. Unable to get his car out of the drivway, he took a bus, a trolley, and a subway to get as close as possible to the stadium, then walked last seven blocks in blinding snow, arriving less than a half hour before the scheduled 1:30 kickoff. The 28,864 hardy souls who actually showed up saw the only spectacular play right away. Daley described the conditions like this: The gladiators slipped and slithered and skidded. They couldn't cut or turn. They couldn't pass. They couldn't kick, every soggy punt dropping down as though it had been hit by a mashie with plenty of backspin on it. With the stadium lights on from the opening kickoff, Jerry Davis took Muha's kickoff on the 3 and ripped off 25y before Craft dropped him. But T Vic Sears' sack of Malhouf forced Chicago into a three-and-out. So Ray punted to the Philly 35. Snow had already covered the field in the short time since the tarp was removed. The Eagles immediately called a play they had planned to open with all week - "81 special." 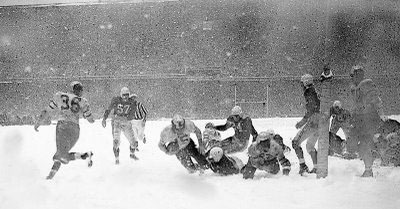 QB Thompson threw a long pass through the swirling snow to E Jack Ferrante who caught it in stride on the Card 20 just behind a pair of defenders, Davis and Red Cochran. Jack slipped down but rose out of the snow and outran the two Cards into the end zone for an apparent 65y TD. However, linesman Charley Berry had called offside. Ferrante recalled the opening play. I don't think I'll ever forget that game. Hell, they won't let me. Tommy Thompson and Greasy always liked to give the opposition something to think about right away. So we worked all week on a pass play for our first play from scrimmage. It was called the "Ferrante Special." That was the thing that made Greasy such a great coach. He could always come up with a play to win. I was to get as deep as fast as I could. They'd call it a fly pattern today. I broke from the line of scrimmage - our 35 - and Tommy just let it fly. I grabbed it at their 20, went down, got up again, and ran in. There was only one problem. The play was called back because of an offside penalty. I was really steaming about that. I went up to the ref and said, "Who the hell was offside?" You know, I was really going to line out the guy that cost us the six points. The ref said, "You." That shut me up! Eagle T Al Wistert isn't so sure Ferrante was offside. I've looked at that film a lot over the years, and I still have doubts. Remember, the field was covered with snow. You couldn't see the yard lines or anything, and the line was set for pass blocking. Sure, Blackjack [Ferrante] was the first to move, but with the linemen all dropping back on that initial step to set up, I think it only looked like he left early. He was the only guy going forward. Naturally, it could look as if he were offsides. If today's rules were in effect then, the official would have blown his whistle and stopped the play as it got started because of the illegal motion. afternoon. But the drive bogged down, and Cliff Patton missed a 44y FG try. Trippi tried a sweep around RE but LB Alex Wojciechowicz drove him onto a snowbank just off the sideline. Then Angsman broke through LT on a quick opener into the secondary. The Cardinals reached the Eagle 30 thanks to a another saunter by Angsman. But Pat Harder's 37y FG attempt missed wide left. This would turn out to be the visitors' deepest penetration of Philadelphia territory all afternoon. Van Buren, moving better than anyone in the ankle deep snow, ripped off two good gains for a first down. Then Thompson decided to pass. Faking a short one, he shot a long throw down the middle, but Cochran intercepted as the period came to a close. A tremendous 50y punt by Muha with the wind put Chicago in a hole and set up a scoring opportunity for the Eagles when Patton recovered a fumble by Angsman on the Cards 21. But two passes by Thompson fell incomplete, and Cochran intercepted the third. Shortly afterward, Mallouf punted from his own goal, and Pat McHugh returned the kick 25y or so. [That's the best estimate from the video with no yard stripes visible.] Thompson faked a pitchout to "The Flying Dutchman" (Van Buren) going left but handed to Bosh Pritchard who rambled through a big hole at LT for a nice gain. Thompson next called on rookie Jack Myers, who took the handoff and rambled about 10y to the 5 (or the 7 depending on which account you prefer). 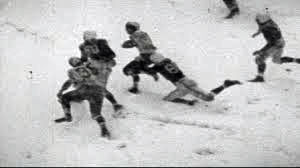 Sending Van Buren in motion to the right, Thompson stepped back and threw to a wide open Pete Pihos but too long, Pete getting a face full of snow as he dove futilely for the ball out the back of the EZ. Patton came on for what would normally be an easy FG attempt but missed to keep the game scoreless. The Cardinals then cranked up a drive that began with a Trippi ramble for 25 or so yards. Then, on a broken play, Mallouf spun left but, finding no one to hand to, reversed and ran up the middle for a few yards. Ray then flipped a quick one to E Billy Dewell over the middle for 15 to the Philly 39. But soon afterwards, Walter Barnes broke though to nail Mallouf for a big loss as he faded to pass as the half came to a close. Rookie "Piggy" Barnes had quickly won the respect of the other T, veteran "Bucko" Kilroy. He was like my running mate. On the field, he looked out for me; I looked out for him. 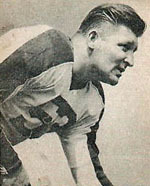 Once, Kilroy walked to the other end of the field during pregame warm-ups to challenge the entire Pittsburgh Steelers team. Piggy said, "You're crazy, you know that." But then he said, "Wait up, I'll go with you." 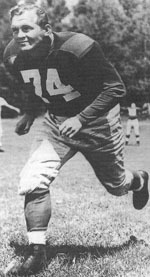 After returning from World War II, Piggy became an All-Conference lineman at LSU and a collegiate weightlifting champion. 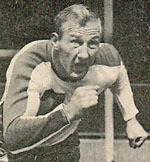 Following his retirement from football in 1952, Barnes became a movie actor. When he died in 1998, his ashes were spread over the field at Tiger Stadium at his request. The Eaglets flag corps supplied the halftime entertainment, braving the snow. Daley marveled that they were dressed as though this were a Tournament of Roses festival. Brrr! The Eagles received to start the second half while the Cardinals chose to go against the wind in order to have it at their backs in the final period. Thompson called the same play that had worked earlier, a fake pitchout to Van Buren going left before pivoting and handing to Pritchett for a substantial gain at LT. But when Steve cracked up the middle, he fumbled forward and Marshall Goldberg corraled the pigskin for the Cards. Mallouf pitched a perfect strike down the middle to Kutner to move the ball into Eagle territory. Trippi sliced off RT for about 8y. On 4th and 2, the Cardinals went for it, handing the ball to Charlie on the same play at RT, but he fell short to turn the ball over to Philly at the 31. Thompson called his favorite play but to the opposite side. He faked the pitchout to his right and handed to Van Buren who crashed through RT for a good gain. Steve then took a simple handoff and dipped around RT into the secondary for 15y. Tommy decided to try a special play that Neale had designed for Pihos: the middle screen. Pete would slide down from his E position and catch the pass as the offensive line formed a wall of blockers in front of him. But on this occasion, the defense stuffed Pete as soon as he caught the ball. Next, Pritchard took a short pitch around the left side but was stopped short of the first down. So Muha punted to Trippi, who took the ball on the bounce inside his 5 and returned to the 19. The Eagles finally got the break they needed when Mallouf fumbled the snap as he pulled away from C, and the ball fell loose in the backfield behind the offensive linemen. 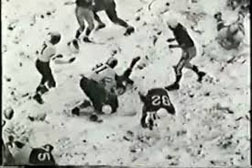 DT Bucko Kilroy threw his 243lb bulk at the ball and covered it as he slid through the snow on the 17. Pritchard took a first down handoff from Thompson after the QB faked a pitchout to Van Buren and slashed for 6y on the last play of the period. Van Buren scores the game's only TD. On second down from the 11, Muha hurdled over the center of the line for 3y to the 8. On a QB sneak Thompson put his head down and drove for a first down on the 5. "Give it to Steve!" the crowd chanted. Sure enough, on the next snap, Van Buren took the handoff from his LHB position and followed Muha through a big hole at RT created by Kilroy kicking out the LE. No one touched Steve until he was crashing into the EZ. The Eagles dropped on their knees and scraped away the snow to clear a spot for the holder, Thompson, to place the ball for the EP try. Thus aided, Patton kicked his 67th straight PAT. Eagles 7 Cardinals 0 only 0:53 into the final quarter. The rest of the period saw the Eagles control the ball as Chicago ran only only six plays. But the visitors started auspiciously when Vic Schwall made a brilliant return of Muha's kickoff, breaking three tackles to gain good starting position. Mallouf faded to pass and, with good protection, hit Babe Dimancheff out to the left for a good gain. But the attack stalled there. After the punt, Thompson again took the snap and faked a pitchout but this time kept the ball up the middle for 17y. Van Buren picked up 4 over RT. On a crossbuck, Pritchard found a hole at LT and burst for 7 more. "Weavin' Steven the Moving Van" swung wide around RE for a first down on the Chicago 47. Pritchard used his jackrabbit speed for 15y around LE. Next, Thompson reprised his fake-pitch-keep-up-the-middle to the 23. But finally the defense drew the line and forced a FG try. But Patton's 34-yarder failed, keeping the Cards' slim hopes alive with five minutes to play. Bosh Pritchard had an unusual off-season occupation: big band singer. While plaing football in the Navy, "The Crooning Halfback" sang with the band at halftime and would have done the same in Philly except that Neale wouldn't allow him. So Bosh did most of his performing after the games. Russ Craft: We'd go into a club, and we'd take bets on how long it would be before Bosh was up on the bandstand. Actually, he was a pretty good singer, but we needled him something awful. Pritchard: I was the team funny man. ... Greasy encouraged it, particularly before games. He said I kept the boys loose. I'd get on the team bus and I'd say, "All right, all together now ..." And I'd start singing the VMI fight song. All the guys would laugh and boo. That's how we'd get ready to play. Conzelman put in QB Charlie Eikenberg to do some chunking, but his tenure started badly with a sack back to the 8. Getting more desperate, the Cardinals tried a dipsy-do. Eikenberg handed to FB Harder running right. Pat threw downfield, but Steele snared the throw on the Chicago 42. "Supersonic Steve" nearly broke loose for a TD around RE, but an ankle tackle sent him stumbling forward to the ground where a defender fell on him. Alternating runners and directions against the exhausted men in red, Thompson pitched to Pritchard who sprinted to the 13. The Eagles ate up the rest of the time with Thompson sneaking to the 2 on the last play of the game. Van Buren runs as Kilroy comes up to block. The jubilant Eagles hoisted Neale on their shoulders and carted him triumphantly off the field. Meanwhile, Philly fans did the same to Van Buren. Eagles rejoice around Coach Neale. Eagles G Duke Maronic: Talk about cold! A lot of us just ran for the locker room after the game and went straight into the hot showers. I mean, we didn't take off our uniforms or anything - just our headgear. We stood under the hot water just to thaw out. It wasn't as cold as some games have been, but being soaked and all really got to you. Captain Wistert exulted as he entered the locker room. Well, gang, we got the championship! That's the one we've been waiting for. Neale gave most of the credit to his QB. We got the break, that fumble, and we cashed in on it. Thompson was the key. He called almost all the plays on his own and called 'em right and he ran hard and handled the team without a flaw. It was a grand game, a wonderful one under the conditions of snow and cold and slippery footing. And a tough one to lose, Jimmy, he told Conzelmann when the latter came to offer his congratulations. Conzelman replied, Your Eagles surely played fine ball. It was tough out there today; those fumbles hurt us, but your boys deserved to win. It was a case of who got the first break. They outplayed us and deserved to win. On the fumble that led to the only score: You couldn't say it was by anyone in particular, just one of those things. Van Buren as he pulled the tape off his banged up ankles after gaining 98y on 25 carries: The boys sure cut me a hole for that touchdown. I went right into it as fast as I could go. Sure was glad to that referee signaling it was over. 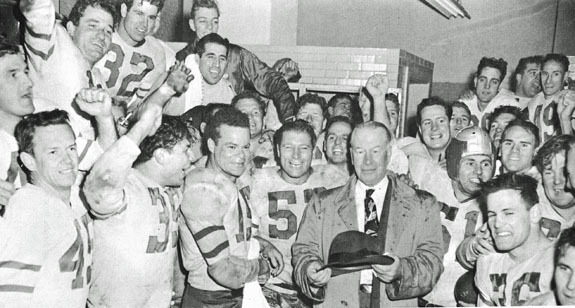 Outside the Eagle locker room, hundreds of well-wishers hammered on the door as Bell came to congratulate the team he owned before becoming Commissioner. A real bunch of champions, he told Greasy. 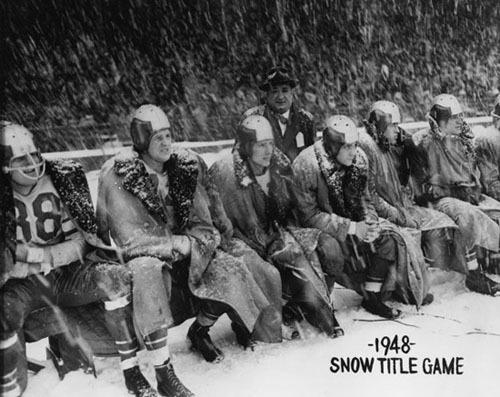 Nobody could have asked for a better game under the conditions. Gloom hung thickly over the Cardinals as they hurriedly dressed, anxious to get away. Trippi: We all knew that the team which got the breaks would win. The Eagles got the break and capitalized on it. They were the better team today and deserved to win. Assistant coach Phil Handler: We'll get 'em next year. Sure, the fumble was the payoff. But we've beaten the Eagles five out of the last six, and we'll make it six out of seven next time we play 'em. But next year has yet to come for the Cardinals franchise. Like another Chicago team, the Cubs, the Chicago/St. Louis/Phoenix/Arizona Cardinals have yet to win another NFL Championship. 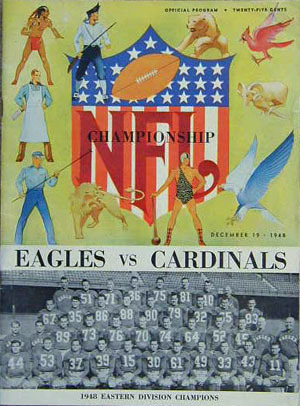 Unlike the Cubs, who last played in the World Series in 1945, the Cardinals reached the Super Bowl after the 2008 season but lost to the Pittsburgh Steelers. The players split 70% of the net receipts of $156,937.50, the second highest in playoff history. 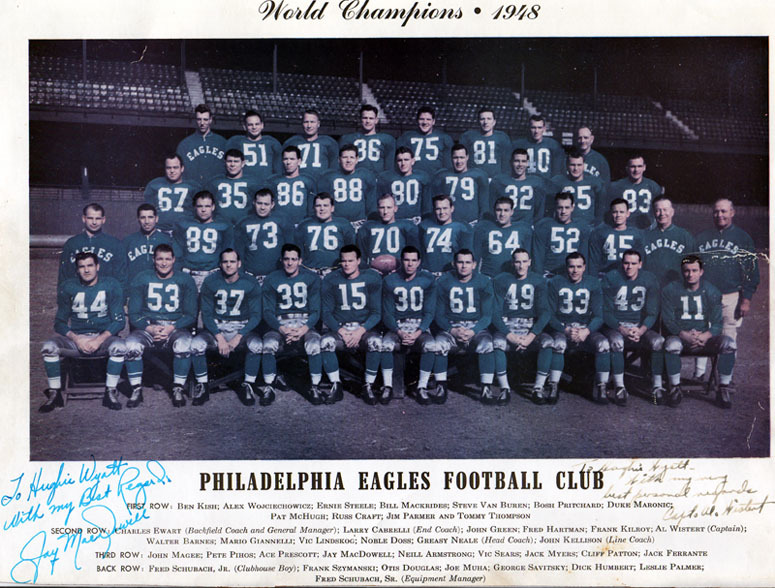 The Eagles earned $1,540.84 per person. The Cards got $874.39 each and voted an equal share for Mauldin's widow. Articles on the title game in Monday's newspapers were accompanied by a piece on the meeting of five AAFC owners, including Arthur McBride of the Browns and Dan Topping of the Yankees, with a corresponding group for the NFL in Philadelphia. For the first time, the two sides sat down at the same table together the day after the title games. The older league's representatives, much better prepared than the AAFC contingent, controlled the agenda. The NFL pitch was simple: They would welcome the Cleveland and San Francisco franchises but no others. While some AAFC owners were happy to go quietly into the dark night with no further losses, Buffalo and Baltimore wanted an opportunity to buy into an NFL franchise. But the NFL reps stuck to their guns - take it or leave it. No offer of a common draft was ever on the table. McBride and Tony Morabito of the 49ers stayed loyal to their colleagues. Unless everyone agreed to dissolve the AAFC, they would forego the opportunity to jump to the NFL. The joint statement after ten hours of stalemate held out hope that future meetings might provide some formula for a common understanding between the two leagues.